Philosophical principles of recovery and justice are driving changing attitudes in the behavioral health arena, but the practical methods used to incorporate these principles needs further clarity. 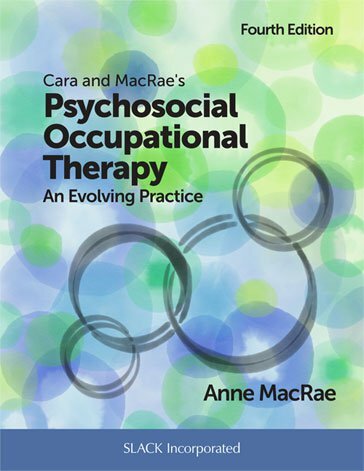 To address this need, Cara and MacRae’s Psychosocial Occupational Therapy: An Evolving Practice, Fourth Edition is completely revised and reorganized. Relevant information from previous editions, including assessments, techniques, diagnoses and specialized programs are interwoven throughout the text with a new emphasis on social issues and lived experiences. Dr. Anne MacRae designed this Fourth Edition to meet practice challenges as the occupational therapy profession continues to evolve to meet the current needs of our communities. It includes specific examples of programs, groups, assessments, activities, techniques, approaches, and outcomes. All new chapters on philosophical worldviews, psychiatric institutions and hospitals, community behavioral health services, and direct service provision, as well as consultation and program development. Reorganized and expanded chapters on built, virtual and natural environments, as well as cultural identity and context. A new chapter on personal and social identity discusses the aspects of identity that are linked to mental wellness/illness including personal choice, family, roles and habits, spirituality, rituals and traditions, as well as the profound effects of trauma, stigma, poverty, and violence. Trauma, stigma, poverty and violence are also identified throughout the text, especially in the case illustrations. Revised chapters on mental health of infants, children, adolescents and older adults. New chapters on mental health of emerging adults and mid-life adults. While occupational therapists can certainly use this material for providing direct services and being part of a team, Cara and MacRae’s Psychosocial Occupational Therapy: An Evolving Practice, Fourth Edition is also an invaluable resource for defining and explaining psychosocial occupational therapy, and in supporting our roles in consultation and program development. Anne MacRae, PhD, OTR/L, BCMH, FAOTA received her bachelor’s degree in education from Antioch College, Yellow Springs, Ohio, and her master’s degree in occupational therapy from San Jose State University (SJSU) in California. She also has a doctorate in human science from Saybrook Institute, San Francisco, California. She is now retired after over 30 years on the faculty at SJSU and was granted the status of Professor Emerita. Anne remains active in occupational therapy as a frequent guest lecturer and consultant, both nationally and internationally. In addition to teaching and consulting, Anne actively engaged in practice throughout her career. She supervised the SJSU campus-based psychosocial occupational therapy clinic for 20 years, provided direct service and developed programs in rural areas, practiced in an urban psychiatric hospital and a partial hospitalization program, and occasionally still sees clients through private practice.